2) Are CBSIs effective and cost-effectiveness in promoting healthy ageing? This research defined CBSIs as community initiatives that seek to: a) empower older people to improve their self-efficacy in caring for themselves and their peers; b) maintain their well-being and; c) promote social cohesion and inclusiveness. The main health benefits important for individuals and communities are often psycho-social, for example, the integration of socially isolated older people into mainstream community and society. CBSIs can lead to people-centred services through engagement and empowerment by, for example, increasing awareness and knowledge that helps older people and their families in navigating complex health and social care options. CBSIs also empower informal carers –many of whom are women. Challenges to wider scale and equitable implementation exist for several reasons. Many CBSIs rely on volunteers or older people themselves as agents of change. Linkages to immediate health and social care systems are often limited. In addition, strategic planning remains a weakness as does the reliability and availability of long-term funding. In many cases, CBSIs begin as community initiatives that fill gaps in services that the community needs. However, such models may not be sustainable, because they are too dependent on voluntary commitment. 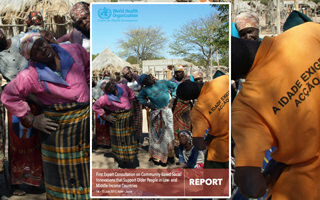 Formal linkages with the health sector are essential, requiring a recognition of the needs of older people in national and regional policies. Future research will emphasize innovations in community-based service delivery, with an aim to assess generalizability, validity, replicability and scale-up potential.